Deciding against an Environmental Impact Statement (EIS) on the Parkway/land-transfer matter, FWS (Fish and Wildlife) published their Environmental Assessment (EA) with a “Finding of No Significant Impact” (FONSI). They’re ready to transfer a 300 foot-wide strip of land along the eastern downwind edge of Rocky Flats (Indiana St.) to the Jefferson Parkway Authority for construction of a private tollway in exchange for adding Section 16 (a plot at the southwest corner of the Rocky Flats site) to the Wildlife Refuge. The EA (500 or so pages) is on line at http://www.fws.gov/rockyflats/ea2011.html. Though the EA was signed on Dec. 2 it was not released until Dec. 15, and even on the following day was not posted on the web site of FWS. The timing and failure to do a news release on a matter of such public concern is puzzling. The Sec’y. of the Interior lacks the statutory authority to transfer land. The EA issued by FWS failed to assess the environmental impacts of construction of the highway with respect to contamination and urban sprawl. The EA failed to assess the environmental impacts of adding Section 16 to the Refuge. The EA failed to assess the environmental impacts of the Parkway on other transportation corridors. 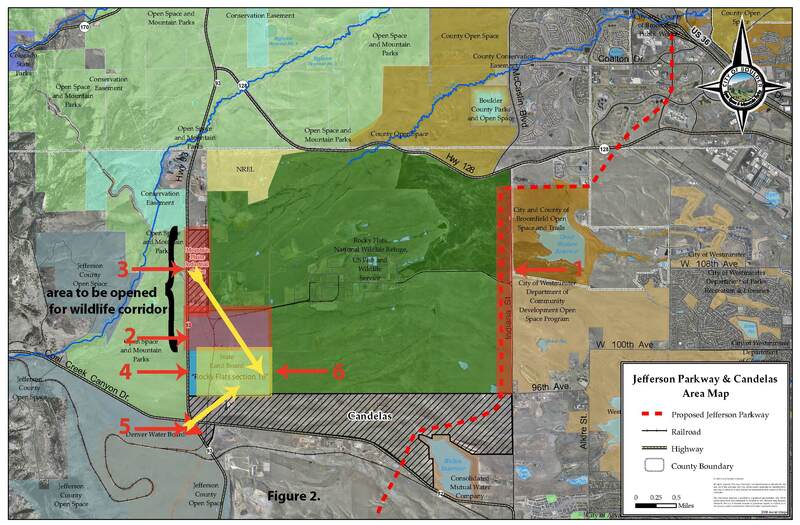 The EA relies on the Northwest Corridor Study issued by the Colo. Dept. of Transportation in 2008, though this study was never submitted to the public for comment nor did it include an EIS. For these reasons and more, the Town of Superior finds FWS’ issuance of the FONSI “arbitrary and capricious” and “not in accordance with law.” Superior seeks a full study leading to an EIS. The Jefferson Parkway Authority and the Golden City Council are evidently close to finalizing a deal that will end Golden’s opposition to the Parkway. Though a final document has not been made available, the deal would, among other things, provide funds to “improve” Hwys. 93 and 6, the routes through Golden that would be utilized by traffic to and from the Parkway. On Thurs, Dec 15, the Golden City Council heard comments. Opponents of the deal expect a council vote very soon, and they are not optimistic. 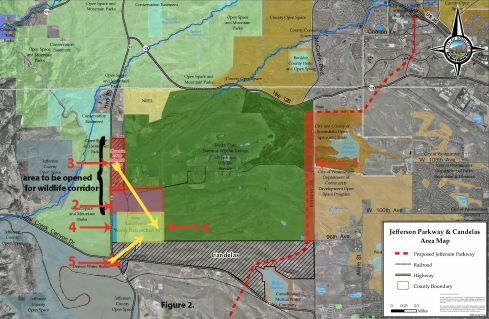 A few months ago the Boulder City Council and Boulder County Commissioners accepted a deal to end their long-standing opposition to the Jefferson Parkway in exchange for helping pay to add Section 16 to the Rocky Flats Wildlife Refuge. Now the deal-making ball has been passed to Golden. For more on the opposition, see http://www.gothebetterway.org/. 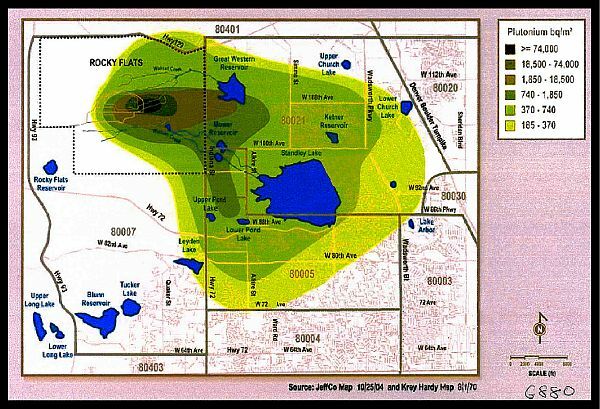 Those of us involved in Rocky Flats Nuclear Guardianship (a project of the Rocky Mountain Peace and Justice Center) are very familiar with the map produced in 1970 by AEC scientists P. W. Krey and E. P. Hardy showing high concentrations of plutonium in soil on and off the Rocky Flats site. Locations where samples showing plutonium were collected (2011) along Indiana St. The findings from our soil sampling are disturbing in several respects. First, the levels of plutonium are much lower than we expected, given the large concentrations Krey and Hardy had recorded in 1970. Since the plutonium used at Rocky Flats has a half-life of 24,000 years, it is dangerously radioactive for at least a quarter-million years. In human terms it poses an essentially permanent danger. The plutonium Krey and Hardy found in 1970 is still dangerous. But where is it? If it’s no longer present in the surface soil near Indiana St., it has either percolated down to deeper levels or it’s been blown away by the strong winds common at Rocky Flats. The first of these possibilities points to the need for the EIS FWS doesn’t intend to do. The second means the plutonium has been carried by the wind throughout the Denver area and beyond, some of it undoubtedly into the lungs of unsuspecting people. If they get cancer 20 or 30 years later, they’ll not know what hit them. 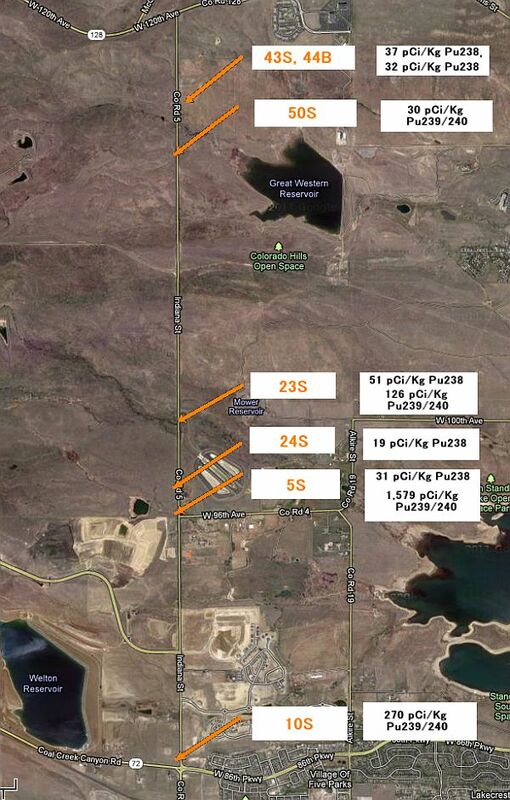 This reality, of course, is part of the tragedy of Rocky Flats historically. Plenty of plutonium in the form of particles too small to see but not to small to do harm has been released across the metro area over the years. Yet there has never been any direct health study or medical monitoring of people who live or work in areas contaminated with plutonium released from Rocky Flats. Hence, no one really knows the actual health effects. This is a cost that has never been counted. And now the cards are stacked in a way that may prevent us from knowing the effects of building a highway along the edge of the Rocky Flats site. Carelessness trumps caution. I learned from emeritus CSU professor Ward Whicker about 20 years ago that background deposits of plutonium from global fallout in soil along the Front Range of the Rockies in Colorado averages 0.04 pCi/g, plus or minus a factor of 2 (ranging therefore from 0.02 pCi/g to 0.08 pCi/g). I believe the determination of this number was made in the 1970s. The late Ed Martell, NCAR radiochemist, insisted that some people would become ill and die as a result of exposure to background plutonium distributed around the world. Here in the Denver area we’ve always wanted to know the effects of Rocky Flats, so we’ve tried to distinguish between background plutonium deposits and the plutonium released from Rocky Flats. If in fact plutonium released from Rocky Flats that was detected in the soil forty years ago by Krey and Hardy has blown away, what has happened to so-called background deposits? Hasn’t it blown away as well? With the decline of atmospheric testing of nuclear weapons less plutonium is available from fallout. We need a new study to determine current average levels of plutonium in soil from global fallout along the Front Range. I suspect such a study would demonstrate that we are comparing current plutonium soil sampling results with an average background number that is inflated because it is outdated. It may be that samples that we regard as “no more than background” in fact are well above background. Who would like to join me in asking EPA and CDPHE to conduct such a study? Next Topic: Intelligent Utility | SmartGridCity: Did Xcel get results?